Chris Boyd says Saints will 'return to strength' against Newcastle Falcons on Saturday as the black, green and gold welcome back their international stars. Dylan Hartley, Courtney Lawes and Dan Biggar all enjoyed a winning weekend, concluding their respective autumn campaigns in style. Hartley and Lawes helped England to beat Australia 37-18 at Twickenham, while Biggar came off the bench in Wales' 20-11 victory against South Africa. Ahsee Tuala's Samoa beat Spain, but the Saints full-back did not play in the game, which took place in Madrid. 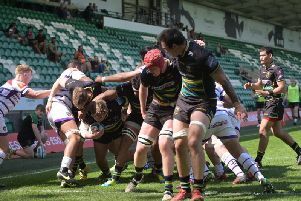 Saints lost 18-13 in a Gallagher Premiership match at Sale Sharks last Saturday and will now be desperate to beat Newcastle before the European Challenge Cup returns. "They (the international players) will have a couple of days off then come back to us this week and all of them should be available to play against Newcastle at the weekend," Boyd said after the defeat at Sale. "Then we go into a double block of European games where perhaps we can give some of those guys some rest then. "But we'll return to strength against Newcastle." When it was put to him that the Premiership appears to be Saints' priority, Boyd said: "Absolutely - 100 per cent. "This little block here against Wasps, Sale and Newcastle is just another little block in the Premiership and I'm just getting used to the fact that in January we play one Premiership game and in February we play one or two. "It's hard to get momentum in the competition but when you do play in it, you've got to take advantage of it." Saints could have full-back George Furbank available against Newcastle if needed. Furbank was forced off after just 36 minutes at Sale, where he was replaced by Ollie Sleightholme. But Boyd said: "Furbs just had a little niggle, nothing too serious I don't think."